I was watching Harry Potter and the Prisoner of Azkaban the other night and noticed that there are these really creepy spine candles scattered about in the Astronomy Tower scene with Professor Lupin. 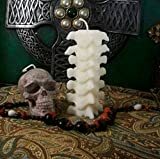 Well, if you too wish you could have those cool skeletal candles for your lowly muggle home, then there's no need to visit the Diagon Alley or the over-priced Hogwarts gift shop, just head on over to Etsy and check out these cool new Spinal Column Candle Holders instead. 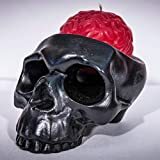 These 3D-printed reproductions of Lupin's spinal column candles can be ordered in different heights and colors and are designed to work with battery operated tea lights, unless, of course, you are able to perform the Lumos spell with your wand. 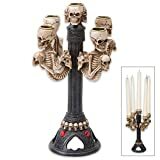 Perfect for illuminating your haunted home during Halloween or anytime you think a creepy skeletal candle holder is appropriate.